Identification Tips: Leaves in a rosette of ovalish leaves. The lemon coloured flowers are solitary and can be from 20 to 30 mm across borne on long hairy stalks. 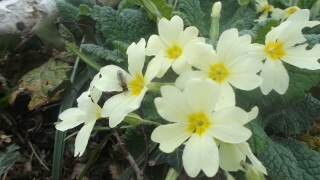 The Latin name of this Primrose is Primula Vulgaris. It is considered that Primus refers to the special place of Primrose as one of the first ‘roses’ or indeed flowers of the Spring. When we were in school, we used to get very excited by the arrival of this flower. We would collect them for a special table that was set up every year for Our Lady in May. Traditionally a string of primroses was left on the steps of a house on the first three days of May to ward off the fairies…!! There are many recipes for primrose wine but it is recommended that this delicate tipple is left to the bees and other pollinators who probably benefit more than we do. This will also help our native ants who help to disperse the sticky seeds of pollinated primrose flowers. Ants and their distinctive ant hills are similarly in the decline across Ireland. If you have an ant hill on your property, it would be worth minding it. This page was added on 20/05/2016.